SAN FRANCISCO - Sept. 24, 2018 - PRLog -- Greenaction for Health & Environmental Justice and Archimedes Banya have filed independent appeals to the Board of Supervisors. According to letters filed by Archimedes Banya and Greenaction with the Board of Supervisors, the two groups argue that the project's negative environmental impact is much greater than outlined in the approved report, and the land has not been adequately tested for dangerous contamination and radioactive waste. The appeal will be heard by the Board of Supervisors on September 25. While the EIR found that the project would create unavoidable environmental damage, especially in quality of air during the construction, the Planning Commission nevertheless determined that the supposed project benefits identified by the developer outweighed the negative impacts. But according to the appealing parties, a combination of project changes and inaccurate information provided by the developer make the EIR determination inappropriate as the project creates potentially far-reaching, irreversible negative impacts to the environment and communities of Bayview and Hunters Point that should be considered in the EIR, and far outweigh any potential positive impacts from the project. Members of the communities are demanding reevaluation of the EIR as key benefits promised in the original proposal have been removed completely, making the EIR's determination of benefits versus positive impacts inaccurate and misleading. The original project as evaluated in the EIR included a school and more than 60,000 square feet of commercial space that the community hoped would be used for a grocery store or other much-needed retail for the underserved Hunters Point neighborhood; however, these amenities were removed from the project after the EIR was prepared. Members of the community argue that the school and the stores were key reasons why the community supported the project and that without these uses, the City must review the project again to re-determine its positive impact. "This is a total bait and switch — the EIR was based on a project that has changed substantially since they first released the report," Bayview resident James Fahey said. "The developer took away a school and 60,000 square feet of stores from the project. We need this in Hunters Point and expected it with this project. Now we have no school, no stores and radioactive waste has been discovered next to the site — this is not the same project described in the EIR at all." 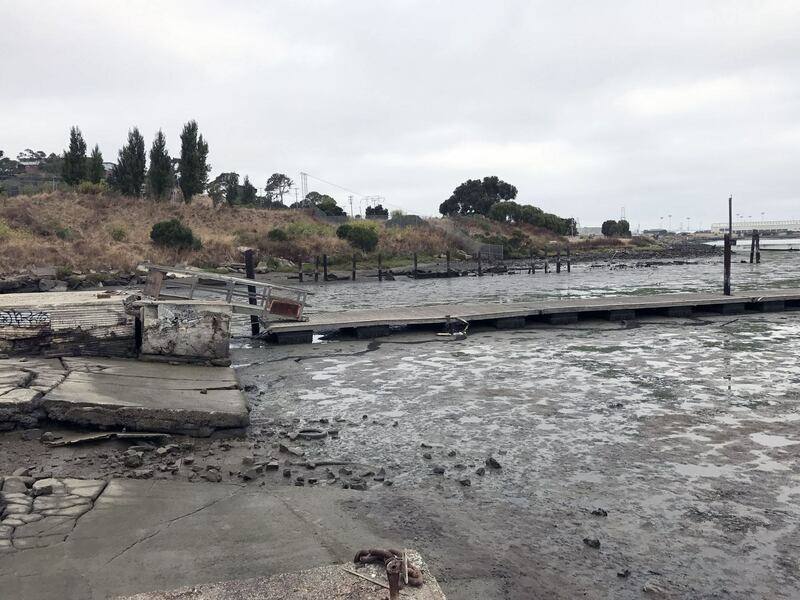 Following the recent discovery of radioactive waste in previously certified cleared land on the Hunters Point Shipyard next to the proposed development site, the community is even more worried about the potential risk of redeveloping the land without adequate testing and remediation. The City's EIR cited historical records to determine that there is no dangerous waste on the site, but the site has not undergone any testing for the type of radioactive waste that was recently found next door in a supposedly "clean" location. It is the opposite, testing done in 1999 for just a small part of the area found lead and chromium contamination 10 times higher than permitted. "Since the original EIR was prepared, we've learned like everyone else of the environmental fraud at the Hunters Point Shipyard," said Jesus Flores, an employee of Archimedes Banya. "They literally just found radioactive waste next door to the proposed development in an area where there was no historical record for it. At this point, how can we believe the historical reports of what was dumped, and where? We need testing of the entire landfill area, which includes this land, before we can understand the risks of this project. If you look online, several maps list the area in question as toxic waste sites, but according to the Planning Commission, this land is safe to dig and throw around. That's a huge red flag." The appeal is being led by Dr. Mikhail Brodsky, the founder of Archimedes Banya and a longtime advocate for the Hunters Point community. "I am appealing because I believe that this project is bad for the health and well-being of the Bayview-Hunters Point community and the City," Dr. Brodsky said. "They want to build towers on landfill that contains who knows what. I refuse to sit back and let them poison my fellow banya lovers, employees and neighbors." Joining Dr. Brodsky in the appeal are Greenaction for Health & Environmental Justice and Hunters Point residents, who have claimed for years that the Navy's cleanup in the area was inadequate and, in some cases, fraudulent. Greenaction for Health & Environmental Justiceis a multiracial grassroots organization that fights for health and environmental justice together with low-income and working class urban, rural, and indigenous communities. Founded in 1997, it has been at the forefront of the environmental justice movement for over 20 years. Archimedes Banyaplays a vital role for our community by providing a setting where people are able to meet and enjoy becoming healthier and feeling better. We believe that the diversity of cultures involved in our facility enhances the social aspect and enriches entertainment life of the San Francisco Bay Area.